>Am I still watching American Idol? For many reasons that I wont detail here I have not been able to watch the latest episodes. 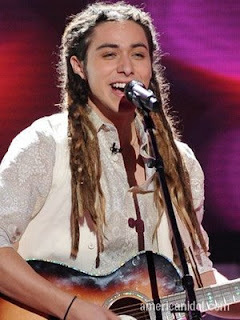 Hopefully for me, my latest favorite, Jason Castro is still in the game. I’m not mad that Carly Smithson and Brook White went home. I was never a Carly fan, she may be a good singer but… I never heard one of her songs that I wanted to hear again. As for Brooke, I liked here a little, she can sing really well but the crying…. no, no, I had seen enough of that since she sang “Let it Be”. I’m afraid Jason might be the next one to leave unless Syesha Mercado chooses a really bad song or if the same thing that happened to Kristy Lee Cook happens to her- she would get eliminated even though she seems to be doing a better job week after week -. Even with a performance like “Somewhere over the rainbow” or “Draydream” he can’t win over David Archuleta or David Cook unless they do something really bad. By the way I wasn’t all crazy about his “Hallelujah” performance. I think he needs to do something very simple but original. So far there are only three contestants I don’t mind listening to more than once a week: Michael Johns, Jason Castro and Brooke White. I think Michael Johns should still have been in the competition but like many others, Carly, Brooke, he felt he had already achieved his dream in the competition, so I guess there was no point in still keeping him. I do believe however that he has the potential to make a great recording artist if they give him the right songs to sing. I think the same thing of Jason Castro and Brook White but those two might be appealing to fewer people. Even though I don’t like David Cook I also think he has enormous star potential. He’s the best stage performer I’ve seen this season, he looks natural and at ease. As for David Archuleta, the judges’ favorite, this season’s 17 year old that they absolutely want to win just like Jordin Sparks last season, I think he should be cast in High School Musical 3– or 4 since it might be too late for 3 -, he could play the new kid in town who’s in love with Gabriella. Sorry for those who’ve never watched HSM-apparently that’s what they call it -and have no idea what I’m talking about.